At first glance, the reply of Concordia Journal appears promising. On further investigation, we find that is not quite what we had hoped for. Their latest (Winter 2018) edition carries the subtext of a smarting faculty at the St. Louis seminary. 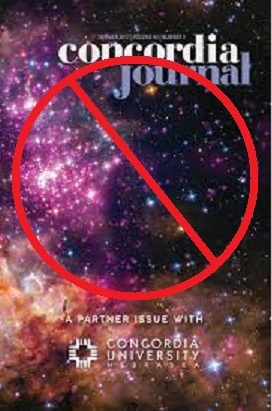 They were wounded, and perhaps surprised that they were wounded, by the backlash they received over their publication in the Summer 2017 edition of an article by Professor John Jurchen of Concordia University in Seward, Nebraska, that implied day-age theory of creation was an acceptable interpretation of Genesis 1-2. The fact that this was indeed his implication was confirmed by his own admission in his letter that was published in the Winter edition: “I was in error to imply that the LCMS has acknowledged Day-Age theory as an acceptable exegesis of the Creation account of Genesis 1 & 2” (14). This implication in his report was already self-evident, but the admission comes in the form of an apology and retraction. The journal leads with a reprinting of the seminary’s December 2017 blog response to this kerfuffle by Charles Arand, the Dean of Theological Research and Publication and by an editorial from Dale Meyer, President of the seminary. The tone of the Arand piece gives some evidence of a subservient willingness to submit to the pious sensitivities of critics, coming with an apology for the lack of clarity, though not without suggesting that the article in question was misinterpreted: “Some even concluded that the article was opening the door to theistic evolution, even though the article made clear that ‘old-earth creationists’ reject theistic evolution” (7). Still, Dr. Arand seeks to assure his readers that today’s seminary is not reverting to the mindset of the seminary that once became Seminex, declaring, ”we will not promote or advocate or defend any teaching that runs counter to the doctrinal position of The Lutheran Church—Missouri Synod” (8, italics original), and then, presumably for good effect, going as far as to quote (yet again) from that old bastion of orthodoxy, the Brief Statement, on the matter, and then, finally insisting “unequivocally . . . that not a single person on our faculty (as well as Dr. Jurchen for that matter) advocates for a ‘day-age’ interpretation of Genesis 1. We all believe that the most natural and plain reading of ‘day’ (especially in light of Exodus 20:8) is to regard it as an ordinary day” (9). Interestingly, Dr. Arand’s quotation of the Brief Statement includes this: “We reject every doctrine which denies or limits the work of creation as taught in Scripture. In our days it is denied or limited by those who assert, ostensibly in deference to science, that the world came into existence through a process of evolution; that is, that it has, in immense periods of time, developed more or less of itself” (8). Dr. Arand follows his editorial with a statement regarding the editorial process of the journal in which he (conveniently?) indicates that since Dr. Jurchen has requested that his article be withdrawn, and that the article was therefore retracted, “that decision obligates us . . . to no longer comment on the specifics of his article, since it is no longer part of the public discourse” (10). But here’s the problem: if we are to take seriously the “unequivocal” statement that Dr. Jurchen does not advocate for a day-age interpretation, we must ask whether the reasons he gave for its withdrawal are sufficient for us or, for that matter, for the St. Louis faculty. There are two addenda to Dr. Arand’s remarks. The first, a letter from Nebraska District President Richard Snow, indicates “fruitful and God-pleasing” conversations that led to Dr. Jurchen’s “letter of confession” and a resultant offer of “God’s Holy Absolution.” The second is the letter of confession itself, which, for a couple of reasons, is disappointing. First, he calls it “a confession of my personal faith and beliefs” (13), which is not the same as a confession of sin for which Holy Absolution is appropriately given. No absolution is needed for a confession of faith, and any district president should know the difference. But the letter does contain an apology, and asks “forgiveness for any confusion I might have caused” (14), though not without several paragraphs in which he tries to explain himself. Most disappointingly, he does not say that he had changed his mind (which would be another matter), or indeed admit anything more than that he was in error to imply that the LCMS has acknowledged day-age theory as an acceptable exegesis (14). But anyone who has carefully read the article should know that it was not an offhand implication about the LCMS that is at stake, but what is evidently the entire purpose for which the article was written: to let students who “struggle” with the age of the earth be “comforted” by the thought that they may believe, without contradiction to the biblical record, that the age of the earth may well be measured in billions of years. As long as parishioners are able to accept the historicity of Adam and Eve, the corrupting influence of sin, and the gospel of salvation, they can expand the days of the creation week to encompass unspecified periods. . . .
We detect no hint of warning in the article against old-earth creationism, contrary to what Dr. Jurchen implies in his letter: “Beyond exegetical difficulties with such an interpretation, several theological difficulties arise . . . namely the mortality of animals before the Fall and the extent of the Noachian flood, the latter of which is sometimes interpreted as a spectacular regional rather than planet-spanning deluge” (Winter 2018, 14). Is he presenting exegetical and theological difficulties in this letter as a warning to students or readers against following old-age creationism? The letter implies so, but the article itself does just the opposite: “An old-earth creation perspective can offer some latitude for LCMS members who hold to the Lutheran Confessions and yet struggle with a young-earth creation approach” (Summer 2017, 71), and goes on to use the flood and the (supposed) mortality of animal life before the Fall to support this perspective. The exegetical difficulty he discusses is a comparison of the covering of “all” the high mountains under the whole heaven in the flood (Gen. 7:19) with “all” the earth coming to Joseph to buy grain during the famine (Gen. 41:57), in which he is allowing for the perspective of old-earth creationism which includes “an approach that assumes the standard geological time scale” (71), meaning, presumably, the time scale accepted without question by those whose conception of time past spans billions of years. The theological difficulty, similarly, presents the “fossil record” (72) of this geological time scale as showing animal organisms that have died before the Fall, a matter that, were it accepted, would present no problems for old-earth creationism, but again, would allow it. Dr. Jurchen’s conclusion asks whether there is a place in the LCMS for parishioners who “struggle with the age of the earth” (72), and answers at length by saying that “we must not present the appearance that the age of the earth if a ‘litmus test’ for orthodoxy” (73). Old-earth creationism is offered here to “comfort” people who “struggle” with the age of the earth. But such comfort would be without legitimate foundation. Not only so, but any such difficulties, raised as they are by spurious science whose dating methods are full of glaringly baseless presumptions and premises, would be magnified rather than assuaged by this line of thought. There are some real exegetical and theological difficulties Dr. Jurchen does not address. Exegetically, one can hardly see how an old-earth creationism can obtain without a day-age proposition, unless it is one that rejects the historicity of the account in Genesis 1. This is troubling, because neither Dr. Jurchen nor the St. Louis faculty admit to any change in point of view on this matter. On the one hand, they insist that they do not follow the day-age theory; on the other, the article in question, which unmistakably proposes it as a way to help troubled students, was merely retracted, but with no accompanying indication of a change of heart or mind. Theologically, and briefly, any failure to connect the creation of all things with the creation of man as lord of them, until the Fall, betrays a faulty anthropology and, by extension, a faulty Christology. Genesis 1 is most certainly an historical record, but it is not merely that. So the seminary’s attempt to set the record straight falls short, in the main because the retraction appears to be of something other than what was really needed. As Wyoming District President John Hill indicated in his December 2017 reply to the seminary, what is needed is not merely a retraction of this article, but a condemnation of it. Added is another editorial, from seminary President Dale Meyer, an exhortation to fear God. Thinly veiled here is another rebuke (the first was directed specifically to the pastors of the Wyoming District on December 1st of last year). He brings up the matter of the controversy (Winter 2018, 15) and, in the same paragraph, notes that God didn’t take sides in the conflict between Job and his friends (read: between people for or against the article that was published), and goes on to warn about such things as the “terrifying day of the Lord” (16), and pride as “a special temptation to pastors” (18). He must have missed the Wyoming District President’s cover letter to the seminary, which states, “I ask that you not mistake the fervor of the Wyoming District pastors for antagonism or pride.” Dr. Meyer concludes his remarks by a reference to older pastors who “look back and say they would have been more compassionate when they were younger” and then by bringing up the eighth commandment and scolding: “Hasty accusations can put a long-lasting cloud over a dear brother’s reputation and life.” (19). With that last admonition we couldn’t agree more, sir. But we are thinking of people like the Wyoming District pastors and their president whom you hastily accused. And we find it necessary to defend such neighbors and speak well of them, as we did last January when we presented the Sabre of Boldness to a churchman who, far from behaving with insufficient compassion or in haste, acted honorably and with all due diligence and care, in hopes of bringing about a truly God-pleasing resolution to this controversy. In view of the forward, not to say shameless, insinuations we see in your editorial, it is evident that we must continue to pray for that. “Church Fellowship is Eucharistic Fellowship, and vice versa”: common ground or bone of contention?